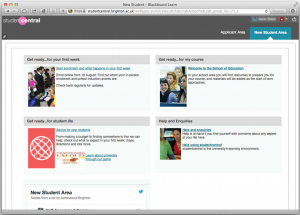 Studentcentral is the name we give to the University of Brighton “Blackboard” Virtual Learning Environment, a tool for supporting learning and teaching, but it also acts as a home page, linking to other systems and services such as Libraries and Email. 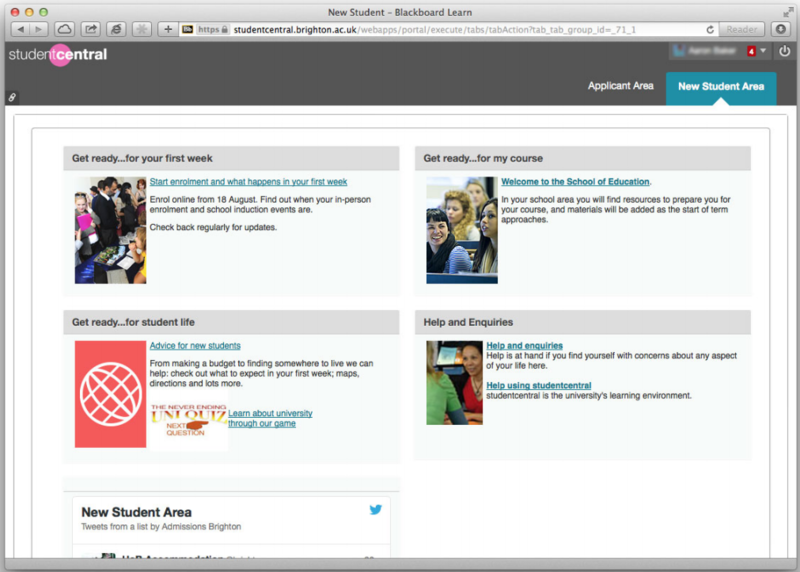 How studentcentral appears to a user varies with their role: applicant, enrolled student or staff. For instance a student applying to a course sees the applicant area and a student enrolled and studying on the course sees a Home and Studies tab. Module descriptions are drafted in formal templated documents which have been approved through School Academic Scrutiny Committees and outline the key module information. Each year an instance of the module may run, and the information about the module, who is enrolled upon it, and what marks they have achieved is held in SITS, the University application for managing student records. In order to provide this modular structure in studentcentral each year around May Schools update their MAV (Module Availability) records in SITS, for each module they intend to run. Once this information has been updated in SITS the module administrators can trigger the modules to create modules instances on studentcentral. A module instance on studentcentral is created with a common structure so students know what to expect, and where things are. Module Guidance – a link which includes an outline of each of these components. A student can access the modules upon which they are enrolled from the time school offices create module taking records in SITS (usually by October), but will be able to access studentcentral and their school and course content much earlier in the year. What a student sees and when.